This is a painting I did from another photograph from one of my sons. 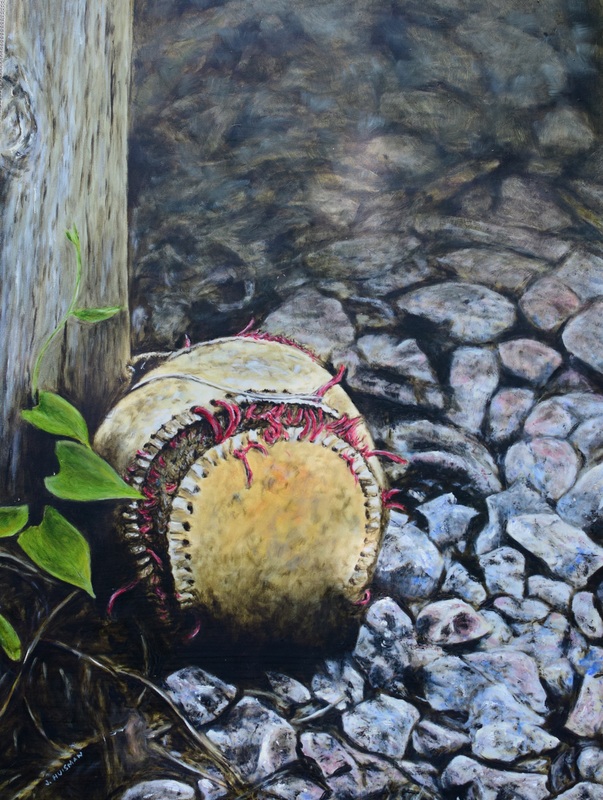 I find it a powerful idea that depicts a brief time in my life when baseball was what we did. Remnants of brief periods in a life watching four young people grow from new born to adult. I decided at the last minute to throw something into the State Fair juried art show and see what happens... This is the second year for me to try this. It is free to enter so what the heck. The drawing I wanted to enter wasn't available, it was hanging at the AWE building through the first of September but I realized I had this oil painting that I had just finished so I updated my artists statement and sent it in. I guess getting past the first round is sort of a big deal I got past the first round last year too but this year I paid attention as I picked up the piece after being notified that I didn't make the final cut again. It looks like there 727 entries into the oil/acrylic and mixed media category and 133 made it to the second round. I guess I feel OK about that. 89 pieces made it to the final cut. I really don't get to excited one way or another about these things. it would be cool to make it one year but for now the painting is perfectly fine hanging on my own wall.